Pursuant to the Money Laundering and Terrorist Financing (Prevention) Act, FIU-the Netherlands is the designated organization where reporting entities must report unusual transactions. FIU-the Netherlands analyses these data to prevent and investigate crime. Pursuant to the Wwft Act, FIU-the Netherlands is the sole organization in the Netherlands where reporting entities should report their unusual transactions. At the organizational level, FIU-the Netherlands has the status of an independent government body. 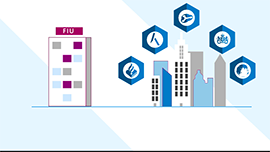 Internationally, FIU-the Netherlands is part of a worldwide FIU network via the Egmont group, consisting of 150 FIUs, FIU.NET and the EU FIU Platform.